This word “fairness” keeps coming up around tax day, particularly in discussions around the Buffett rule. Conservatives invariably counter that it’s not fair for 47% of households to pay zero federal income tax (most recent data from 2009). Liberals counter with two points. First, as the figure below shows, almost everybody pays taxes, and in fact, when it comes to payroll taxes, the middle class pays a higher effective rate than the wealthy (because those taxes cap out at around $110K). Middle and low-income households pay an effective rate of about 9% on payroll taxes; the top 1% pays 2%; middle-income families pay 17% of the total payroll tax bill; the top 1% pays 4%. And state tax rates tend to be pretty flat. 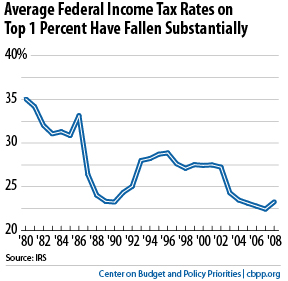 Second, as the next figure shows—and these are important data points in reference to the first fairness principle above (progressivity)—the actual effective tax rates of the wealthiest families (taxes paid as a share of income) have fallen quite sharply, because a) supply-side tax cuts from the Reagan and GW Bush era only partly offset by Clinton’s progressive changes in ’92, and b) their pretax income has grown so much more quickly than their tax liability. In other words, the wealthy have been paying a larger share of federal income taxes not because their tax rates have gone up—in fact, they’ve gone down. It’s because they’ve been collecting the lion’s share of the growth for decades. A key factor here has been the large decline in the rate of taxation on asset-based income, like capital gains, and the much increased concentration of that income among the wealthiest families. Those changes are related—once you advantage a particular income type, you’re going to see more of it. And these dynamics are also related to the bubble and bust syndrome in which we’ve been stuck, along with the financialization of the economy, both of which are problems to be discussed another day…let’s stick with fairness for now (though I could see another principle here: a fair tax system doesn’t incentivize the underpricing of risk, leading to busts that invariably whack the have-nots who are then called upon to bail out the haves; in practice, this principle would militate ending the favored treatment of debt financing in the tax code…hey, I like that…let’s call it principle #6!). Anyway, that’s the rationale for claiming the Buffett rule increases fairness: it partially repairs the diminished progressivity with respect to certain millionaire+ households, specifically those with most of their income from capital as opposed to wages. Now, you might object to progressivity, but I’d argue you’re starting from a different place than most of us. Sure, you’ll find folks to agree with you—advocates of the flat tax might join you, for example. But those of us invoking fairness are generally invoking the progressivity that has always been a bedrock feature in the federal income tax. And that is as it should be, particularly in an era of so much pretax income inequality. The fact that tax code has become less progressive in a period when the pretax income distribution has become more unequal is another dimension of unfairness–a violation of principle #2. The figure below shows that the system of taxes and transfers (which are, of course, related as the former pays for the latter) has become less of a bulwark against inequality over time. It shows that inequality grew 10 percentage points faster after taxes and transfers than it did before. I won’t go through all the above principles, other than to say that #4 is clearly in trouble and this redounds to #3. Were we to follow the roadmap in the House Republican budget—for that matter, any Republican, supply-side, trickle-down tax plan–we would very much be violating those two principles, as these reverse-Robin-Hood schemes redistribute upward. It’s not simply that these plans lower taxes on the wealthy much more so than they do on the poor. It’s that they leave us with too little revenue to help offset the disadvantages that block the opportunities of the least well off, that provide them a safety net in hard times, that help them meet basic needs of food and shelter. It is not at all hard to connect the dots between regressive tax changes and cuts in Pell grants, nutritional assistance, retirement security, and pretty much everything else. Finally, despite all the predictable caterwauling, the only tax fairness principle that seems intact is #5. If you were rich or poor before tax day, you’ll be so again tomorrow. Of that, you can be certain. Share the post "What’s Fair? Five (or Six) Principles of Tax Fairness"
16 comments in reply to "What’s Fair? Five (or Six) Principles of Tax Fairness"
Not to mention that with a more progressive tax system, more stability is built in to the economy. But, of course, who cares about a stable economy these days? In a perfect world, our policymakers would understand that the federal deficit and the national debt are our friends; they are the complete opposite of personal debt. Until our policymakers and a majority of the American people understand this, we will linger in this depression. John C. Williams, president and CEO of the Federal Reserve Bank of San Francisco, recently stated, “I expect unemployment rates to remain around 8% through year-end.” So he agrees fully with you on the economic outlook, Dr. Bernstein. Um, isn’t the reason that so few people pay Federal income taxes fundamentally wage stagnation? Corollary question: If we raised the minimum wage by $1 (or any give amount) what does that do to overall SocSec revenues? A great and clear rebuttal of right-wing tax spin, Jared. Well done. I get especially irritated by working class folks arguing for a flat tax. Credulity is a low energy state. Critical thinking is a high energy state. It’s the natural order of the universe to seek the lowest energy state possible. Trying to get someone to think critically about a topic is literally combating a force of nature. Near the end of the Gilded Age after World War I the Revenue Act of 1921 was passed after Republican Secretary of the Treasury Andrew Mellon (also the banker) argued that significant tax reduction was necessary in order to “spur economic expansion and restore prosperity”. Mellon obtained a repeal of the wartime excess profits tax and the top marginal rate on individuals fell from 73% to 58%. But the preferential treatment for capital gains was first introduced at a rate of only 12.5%, effectively lowering the wealthiest individual’s tax rates from 73% to 12.5%. A windfall for the super rich that’s been in place for the past 90 years. …by not extracting all the wealth from the bottom to the top, where the wealth is only hoarded for their future generations, instead of being circulated throughout the present economy. Organizations such as The Family Wealth Alliance have members who meet regularly and strategizes preserving family wealth for many generations to come. Jaime Johnson, an heir to the the Johnson & Johnson family fortune, discusses this in his excellent documentary “The Top One Percent”. Paris Hilton, Kim Kardashian and Jaime Johnson are but just a few examples. Keep in mind that when you say “flat tax”, you aren’t talking about the same beast as do people who actually propose one. What they mean is “flat tax on earned income” and they prefer zero tax on investment income (dividends, capital gains). Also, in reality, they’d prefer a head tax over a flat tax– that’s their real definition of fairness. – Thanks for taking this one on. I’ve asked this question on many leftie econoblogs, but noone ever responded!? – Isn’t the US tax code the most progressive in the developed world? E.g., we rely much less on (regressive) consumption taxes than Europe. – Since the lower investment taxes are allegedly to balance the corporate profits tax, why not get rid of both? Tax investment income at ordinary rates and dump the corporate income tax. Would that be fair? – Not sure what that means. Trying to be literal, any progressive tax system would seem to qualify. – Our current system provides lots of such legs. I guess fair means that we need to pay for them by increasing taxes enough to eliminate the deficit immediately. Please correct me if I missed something. – Any progressive (or regressive) tax system rearranges the pretax income distribution. I don’t see how to square that circle, unless “…does not too much rearrange…” is implied instead of what was actually written. – You’ve seen conservatives argue that taxes on some group should go up? Grover Norquist would eat them for breakfast. And state tax rates tend to be pretty flat. – What state is that? 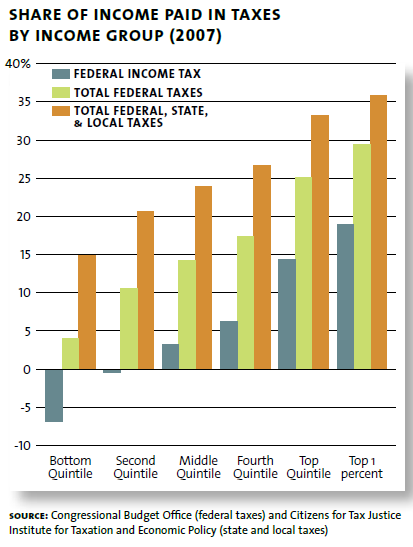 While sales taxes are regressive, state income and property taxes are generally quite progressive. –our code does not rearrange the pretax income distribution such the ordinal rankings of rich, middle, poor change at all in the posttax distribution–that’s what I meant. –you’ve got a point re #2, but I want to see score before I sign off–must be revenue positive, not just neutral. –Europe much more progressive when you consider taxes and transfers, which is what you should do…that’s why the pols always rant on the Euro welfare state! –#3 just means you don’t take from poor and give to rich, ie, as in Ryan budget (cuts food stamps, Medicaid, etc. and uses some of those savings to cut taxes disproportionately at top). Thanks for the response! I take your point re the link. On #2, my proposal has ancillary benefits that may also relate to fairness. It should make the pretax income distribution by reducing the ranks both of the highly-paid lobbyists who seek to further corrupt the tax code and of the tax accountants and lawyers whose relatively high income is propped up by the code’s complexity. Another group of beneficiaries on the after-tax side are the pension funds that would see higher after-tax returns. Revenue neutrality is about #4, right, although if it increases fairness, I don’t know why you’d have a problem, given that higher deficits are purportedly more stimulative and I understand you to support more stimulus. While Europe does run more of their economy via the state, that’s not a matter of tax code fairness. By your principles, we have a fairer tax code (I presume) and an insufficiently fair spending profile. Curious about your thoughts on my favorite tax regime, Robert Frank’s progressive consumption tax. It reslices the pie of goods and services, rather than income, which seems much more relevant to our daily lives. Unspent income gets invested, producing more jobs and more stuff. – Part of this is because their income has shifted towards investment income. Saving and investing can have that effect over time! a fair tax system doesn’t incentivize the underpricing of risk, leading to busts that invariably whack the have-nots who are then called upon to bail out the haves; in practice, this principle would militate ending the favored treatment of debt financing in the tax code…hey, I like that…let’s call it principle #6!). – How did the tax system contribute to underpricing risk? – So more progressive is more fair? But at some point more progressive becomes “confiscatory” and “redistributive”. Does “fairness” show us where to draw the line between the two? The fact that tax code has become less progressive in a period when the pretax income distribution has become more unequal is another dimension of unfairness–a violation of principle #2. – Now we’re deeply ensnarled in contradiction. We still don’t know how progressive you have to be in order to be “fair”. The figure below shows that the system of taxes and transfers (which are, of course, related as the former pays for the latter) has become less of a bulwark against inequality over time. It shows that inequality grew 10 percentage points faster after taxes and transfers than it did before. – Now we’re introducing inequality into the discussion. Is inequality the measure of fairness? If so, how income-equal do we have to achieve fairness? – The tax code in that budget is still progressive, i.e., still fair by the official principles except for the pay-for principle, unless the Reps are right that a faster-growing economy will produce higher revenues. My question relates to the chart, “Share of income paid in taxes by income group (2007)”. Does the “income” on which the chart is based include inheritances? If it does, it is realistic, but if it does not, it is not realistic. If the top 1% can say they paid the highest percentage in total taxes, but if the tax rate is based on a total for income that does not include inheritances, then this is meaningless. #3 may be the worst example of “progressive demogoguery” that I’ve seen. The assumption seems to imply that anyone doing well does so at the expense of another. What a complete load of crap but the sort of “stuff” that is often thrown out there in an effort to scapegoat and divide Americans. That type of nonsense needs to stop. Our tax system is extraordinarily progressive with the top 10% of earners paying ~70% of income taxes. The bottom group of income earners pays zero to negative taxes (getting back money from EIC or the dopey making work pay program). In fact our tax code became increasingly progressive under Bush (yes, even with the evil Bush tax cuts!). For those who want to return to the Clinton era tax rates, well those rates were 50% higher at the lowest marginal rate (15% versus 10%). Oh but wait, it is only a return to the rates for the highest level of earners because, well hey, the economy was great then! That may be the single dumbest assertion made with seriousness. The economy grew in that era NOT because of high tax rates but because of a generational disruptive technological innovation – the Internet and Web. Companies grew at an astounding rate resulting in huge capital gains tax revenues. Oh, but that was a bubble too and it ended badly and to date the NASDAQ is still only 60% of the bubble highs! The tax code is progressive but it is way too complicated to be effective. Simplification has to be a part of reform and fairness. Scapegoating the financially successful (the Obama way!) is evil.